Here is the response to our letter, not from Ed Balls (shadow children's secretary) himself but from a member of his campaign team. See here to read the letter we sent to both Ed and to David Cameron. 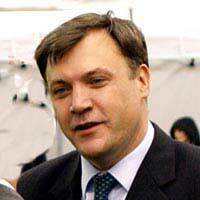 Thank you very much for contacting Ed Balls on behalf of John Rowlinson of Separated Dads. I am a member of Ed's campaign team and he has asked me to get back to you on his behalf. First, I am very sorry that you have waited so long for a response. Turning to the questions you have raised, with your letter to Ed you attached another letter that Mr Rowlinson had sent to David Cameron concerning equal rights for fathers and mothers over contact with their children, after separation or divorce. You asked to know what Ed's position is on this. Ed's position is set out in the Green Paper he published on family policy while Secretary of State for Children, Schools and Families. The Paper was called 'Support for All' and came out in January this year. You can access it via the Department for Education's website. In the Paper Ed made it clear that the Labour Government's view was that it is important that children are able to have continuing relationships with both parents after separation and divorce because this is good for them and good for families. The only times when this shouldn't happen are when there are serious concerns about violence or abuse, making contact unsafe and therefore not in the best interests of that individual child. The Paper drew on the available research evidence in explaining why this conclusion had been reached. The Paper did not include a commitment to change the law so that the starting point in family proceedings is a '50:50 split', as has happened in some other jurisdictions. The Labour Government's position was to encourage a shared parenting approach by agreement between the parties, wherever possible. It did not though seek to achieve this through a legal presumption. As you probably know, the Green Paper also announced a full and thorough review of the Family Justice system more generally, to be carried out jointly by the Ministry of Justice and DCSF (as it then was). That review is underway and is now the responsibility of the coalition Government to take to a conclusion. I am sure that as part of the review there will be an opportunity for you to submit your views. I hope this clarifies Ed's position and provides the information you were seeking. Many apologies again for the delay in this response. It is compulsory for a young person to stay in some sort of full-time education or training, for example at a college, start an apprenticeship or traineeship or spend 20 hours or more a week working or volunteering, while in part-time education or training. Full-time education when a child studies a course for an average of 12 hours per week during term time. Break times and unsupervised study time is not included in the calculation. If a young person chooses to work outside of education for 'pocket money', then this is considered at the young person's discretion. The primary carer will still be supplying the day-to-day needs of the child. Therefore, the paying parent is also expected to contribute. CMS changed to calculating the non-paying parent's gross pay (CSA calculated from net pay). One of the reasons for the change to gross payments was to prevent the paying parent sidelining large amounts of money into the likes of personal pensions in order to reduce their net amount. Its disgusting that this is still going on. Im lucky as i do have access to my son, (6 yr old) but now nowhere near as much. I used to have an amazing amount of quality time with him. They honestly might as well write a father's 'P.R' information on the toilet paper in the ladies loo's!. I was put through 'hell' by sons mum, 'P.R' totally ignored etc. The judge couldnt have cared any less about me & my sons relationship. Got the feeling i wasted his time trying to get someone to help, & show someone what was reall going on. I am sorry to hear this. However, if you have had access before, then you can go through the procedure laid out in the article: When Your Ex-Partner Denies You Access, link here . I hope this helps. @David - thank you for your heartfelt words and yes you do have a point. However, I can't understand why you should not be allowed access or parental responsibility. To get this you would need to go through the courts and you can self-litigate which takes away the hefty court costs, see our partner article; Legal Aid Withdrawal: How to Represent Yourself here. There are a lot of fathers finding success this way. Our Separated Dads Facebook page may help you too, if you read back through some of the previous postings there is a lot of good advice contained that can help you gain access. I hope this helps. This is unacceptable fence-sitting by Ed Balls whose government was never particularly pro-shared parenting despite what he says now. There does need to be a legal presumption of shared parenting. Moreover if serious child safety concerns are raised by the mother but found as either bogus or exaggerated then there should be an additional legal presumption that she is not wholly fit parentally with more contact awarded to the father accordy. This is a very emotionally charged issue, and I personally believe that parents should take 50/50 responsibility for their children - in all matters - wherever it is safe to do so. I've made it as easy as possible for my children to have the access to their father that they need, including changing my job and moving a couple of hundred miles so that their father didn't have to travel that distance and back every other weekend. This was done with the kids' best interests at heart - and in spite of the fact that their father initially said he was only temporarily planning to live that far away and then changed his mind, upsetting the children a great deal. Money and access are completely separate in my view and should never be connected - I believe a father should pay 50% of the costs of raising his children (but also taking into account however much of the costs if any are paid by the state). If, as has often happened in my case, maintenance is not paid, this should have no effect on access to the children - but this is important - AND VICE VERSA. If you have an unreasonable ex, that is bad for all, but the costs of raising a child remain the same regardless of access. This responsibility does not change. I would like to see more actual perception in these comments that the children and their welfare comes first. Regardless of any bad behaviour by mothers. The kids are the ones that end up hurt when people engage in any kind of tug of war - and if you have established that your ex is happy to be unfair - your understanding of this and not doing anything that could inadvertently hurt your kids becomes even more important. The law can and should do much - but you must take responsibility where the other parent will not, and make sure you don't fight in a way that could cause them harm. What is happening to you may not be fair, I understand that - but you are eminently more able to cope with it and deal with it than your child/children. I have had a court order giving me access every other weekend to my children and yet, when I took it to court to try to get it made enforceable the judge ruled in the ex's favour stating that I was trying to get the order changed. I was made to pay her costs for the case and all the preceeding work - money I couldn't afford.The last sleep over they had at my place was Aug 2008 and since then I have seen them only once or twice a year, usually around their birthday. This is hardly equality yet I am still expected to pay my maintanance to the CSA for them. It's about time that the CSA payments were linked to court orders to say that if the orders are ignored then the payments shouldn't be made. Mr Balls colleague simply seems to skirt the more important issues raised in the letter! Such as why mothers often appear to get carte blanche when it comes to family courts, more so for her needs rather than the childrens! I am truly amazed by the way at how many stories on here seem so similar to my own by the way! No happy ending for me yet having waited the best part of three years now and I havent seen my little girls for the entire three years, but al keep fightin as we all should brothers!